To see how Docsvault’s integration capability allows you to reap these benefits, here’s a list of all integration features of Docsvault. Paper trails are the pain area of all organizations globally as they hamper flow of business processes and reduce productivity. The Docsvault automated workflows not only make these paper trails manageable but also help enhance processing and productivity. Users can create simple or complex workflow cycles without any coding using a simple point and click graphical interface. Companies can save time and money by creating workflows that automate repetitive document processes like account payables, leave applications, purchase authorizations etc. The user can track workflow items moving through the system and as a result identify bottlenecks to enhance the speed of your mundane tasks. Automated notifications and complete workflow history logging ensure prompt action and supervision. Docsvault has a built-in task management system which allows users to focus on their core tasks by taking care of the routine jobs like sending documents for review, approval or comments thereby increasing productivity. Users can easily route documents, assign tasks to multiple users and communicate back on forth on a task for its faster completion. A built-in notification system alerts users when a task is assigned, due or completed. Docsvault has a slew of features and functions for accessing and processing documents from anywhere. The documents are worked upon by users from multiple departments which require all concerned parties to remain on the same page. Automated alerts and email notifications keep everyone up-to-date on all big and small changes made in the central repository. These customizable alerts help cut down the time lost on manual interventions and leave no chance of missing out on important actions being performed on the documents. 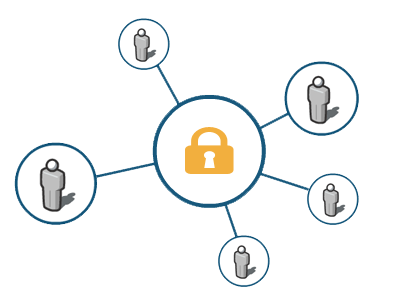 Public share links are secure and convenient solution to share documents with people outside the organization. Authorized users can create public URLs of files or folders in the Docsvault repository and share the URLs with anyone via email, instant message or over the web. Access to documents can be secured with passwords, expiry dates and can be protected from downloads. Enable access to selected documents quickly, easily and without attachments or uploads to external sites and track download activity with built in link reports. In a multi user environment, it is essential to prevent simultaneous edits to the same documents by different users to prevent overwriting others changes. Docsvault helps organizations avoid this by employing checkouts and check-ins for your digital library. When a document is checked out for editing by any user, it status is locked to other users and they can right away see who is currently working on the document. Other users can however get a read only copy of existing version in Docsvault and can also request a checkin of the document with a simple click. Furthermore, users can be notified when the document is checked in and a new version of the document becomes available. The version control feature allows users to access or revert back to previous versions of a particular document from its version history dialog. Docsvault offers users a shared common space where they can drag & drop and share files with external users like customers, vendor s and business associates. Access to the Docsvault repository through an online portal is secure and the external users can access only selected portions of documents and cannot see any additional internal information. They can be called the digital version of sticky notes. These provide useful information to the users about the actions performed on a particular folder, document or cabinet. It helps in keeping the users on the same page about the status of the document which would ensure smooth collaboration of the document between two departments of an organization.